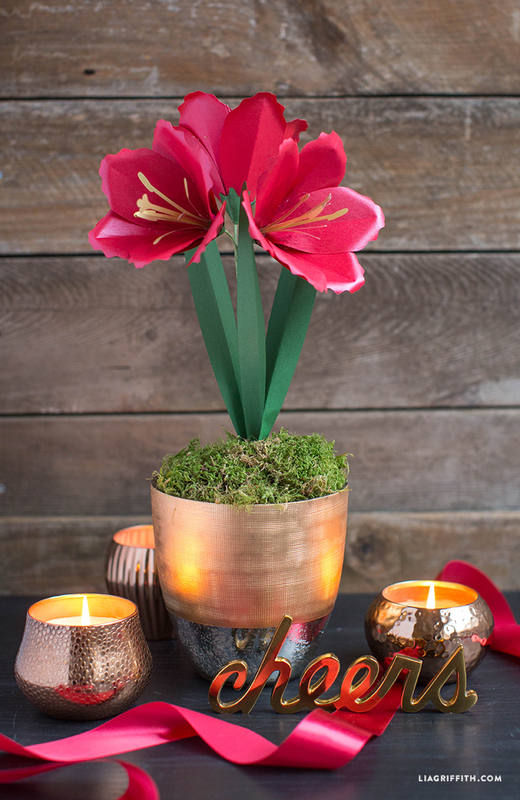 The amaryllis is great blooming plant for the Holiday season. 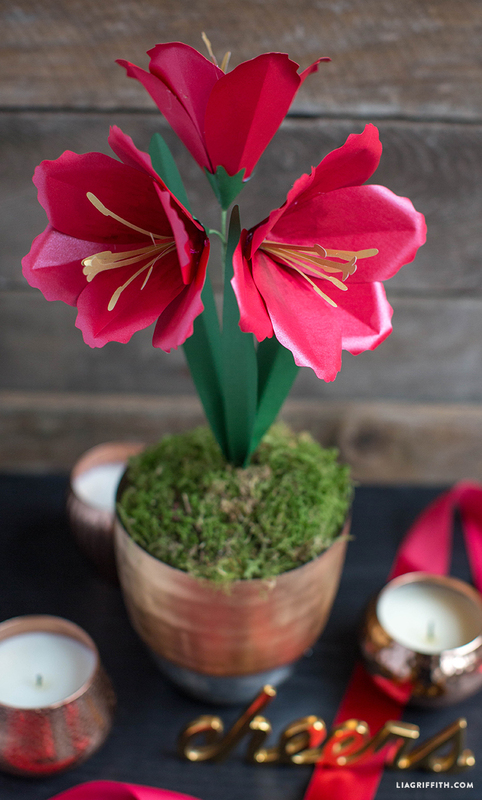 For that reason an amaryllis paper flower makes a gorgeous handmade gift to give during the Winter months. 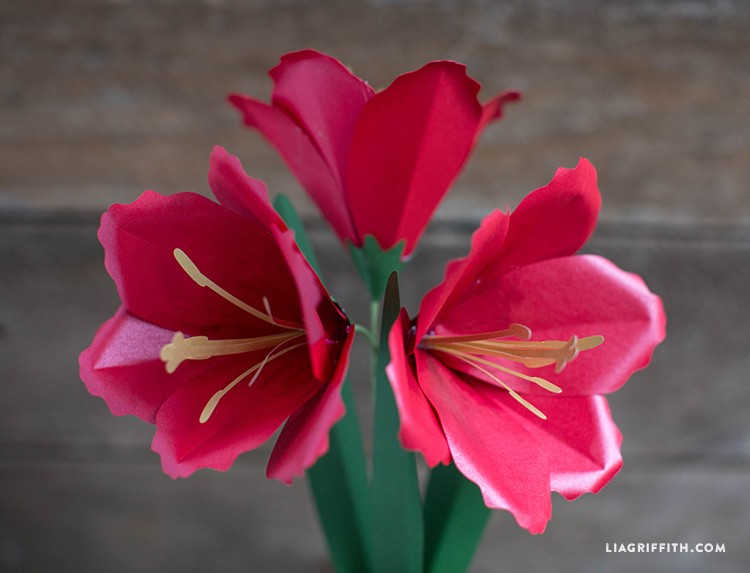 I have designed this paper amaryllis flower as a potted version for just that reason, but the bloom looks equally pretty in a vase or, if you want to leave off the stems, you could use it on a handmade wreath or as a gift topper – perfect! I have seen a common thread in the last few projects I’ve seen. Is the 8.5×11 paper the size used most often? I’m just starting into this and want to stock up on essentials in the paper area. Any tips would be so welcomed. Thank you! For most leaves (including the ones with the amaryllis), I use the color Botanic. It is perfect rich green. I hope this helps! I have got to try making these. Since my attempt to grow them. Wasn’t to successful. Thank you for all the tutorials. Love them. Thank you, you are so welcome! Your designs and crafts are TRULY a masterpiece. I love every tutorials! Subscribing soon! I have these cut out on my work table–I’m hoping to get to it this weekend. But between Buche de Noel class last night, Gingerbread House with BFF tomorrow and a girlfriend afternoon of gingerbread Sleigh and Reindeer decorating on Sunday–Yikes!! Where does the time go??? Before you know it, we’ll be doing dozens of red roses for Valentine’s Day!! Best wishes, Lia–to you and your family–for a very Merry Christmas and a healthy and prosperous New Year!!!! So glad to hear this!! Happy holidays to you! How can i get the cutouts..
What is the wire gauge size. I love every flower you create and they are so well made. Do you use 12″ floral wire? I made the amaryllis which looks fab, but perhaps a bit short. I have some 14″ wire so will try that next time. I am going to make some as presents for Xmas. Thanks! I was really happy to see the Amaryllis flower added. I started working on it right away tonight. One piece of feedback on the template: The leaves and the petals have a dotted line down the middle that indicate the crease, but the dotted line shows up on the print out. I used white out to erase the line and then made my own template from that. I think it might be best to leave out the line and demonstrate where to crease in the tutorial. Another excellent flower! Its gorgeous but would like more info on the paper. There’s a lot of red metallics out there. Hi Lia, the description says you used Mars. I just want to clarify because I’m asking Santa for lots and lots of paper from this company for Xmas and I want to make sure I get the right one.. Thanks! Jupiter AND Mars would Beth be great for this. Jupiter is more of a red-red!!! Scrolling down to see your creation, it looks sooooo real. I love all your paper flower post! Always so pretty! Adding this one to my to do list. Beautiful! I love that metallic paper.